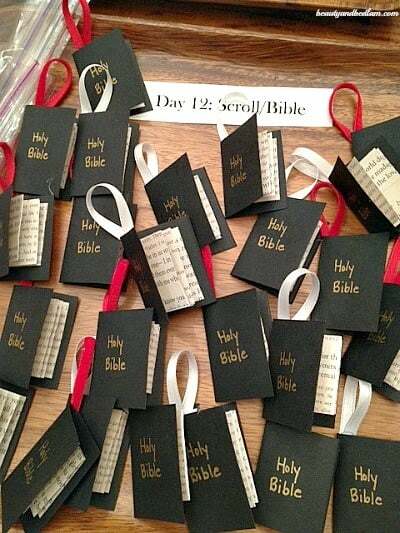 Instead, I used the same scripture stories and created my own simple kids craft advent teaching all of the life of Christ. And we loved it! 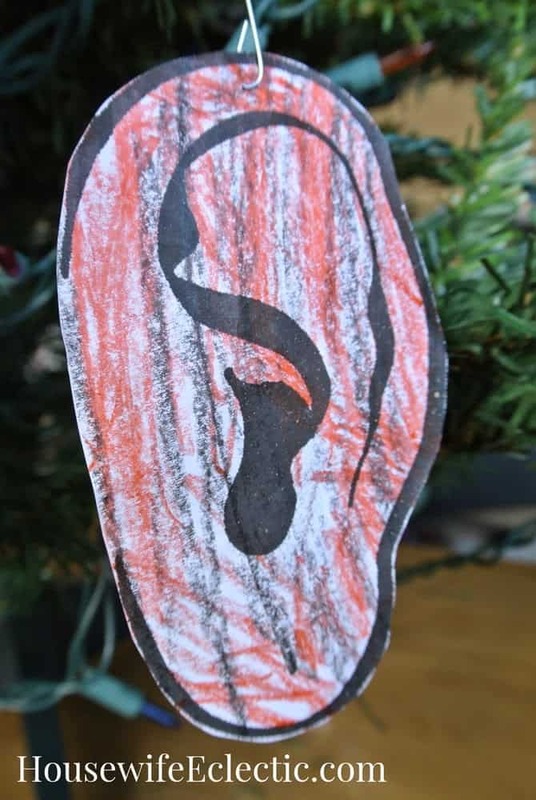 In about 10 minutes each night, we had a short devotional and crafted an ornament to remind us of the story we read. 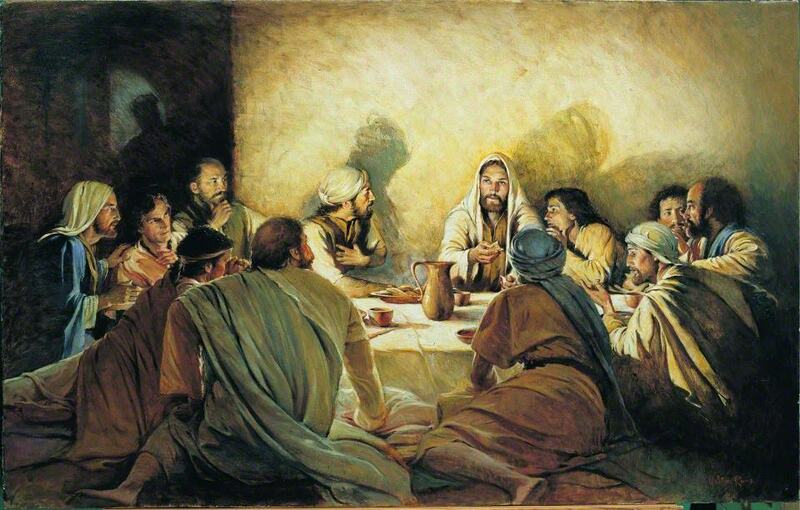 This all-important family time helped us learn and discuss the gospel, invite the Spirit into our home, and enjoy each others’ company. We culminated the 25 days by opening a special present on Christmas morning — a heart-shaped tree topper to remind us that the most important gift is God’s love to each one of us, given freely and not based on whether we’ve been “naughty or nice”. Our quick devotional before we headed downstairs to open presents set the tone for the rest of the day, and sealed for us that we wanted to do this again. 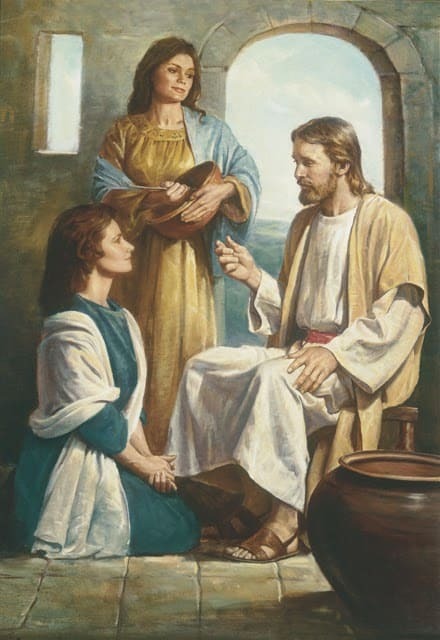 We also supplement most nights by reading the same scripture section out of the children’s scriptures (in addition to directly from the KJV), and if you’re interested in also using short videos, the 25 Days of Christ site includes great links to gospel videos (or you can access the whole Bible video library here). 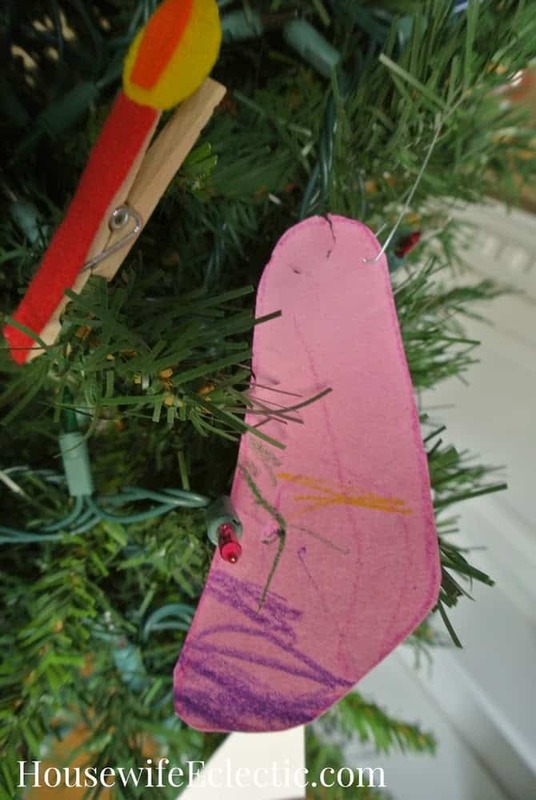 For most of the advent ornament crafts, preschoolers will need some help with cutting, while older children will be able to do it on their own. I’ve also included some additional options to help you adapt the crafts to your children’s skill and interest levels and your available materials. Print a 1-page (front and back) quick reference sheet + printable ornament templates here (or for Bible-only, here) — which includes the each day, scripture, picture #, and craft supply list. Instructions for each craft are below. 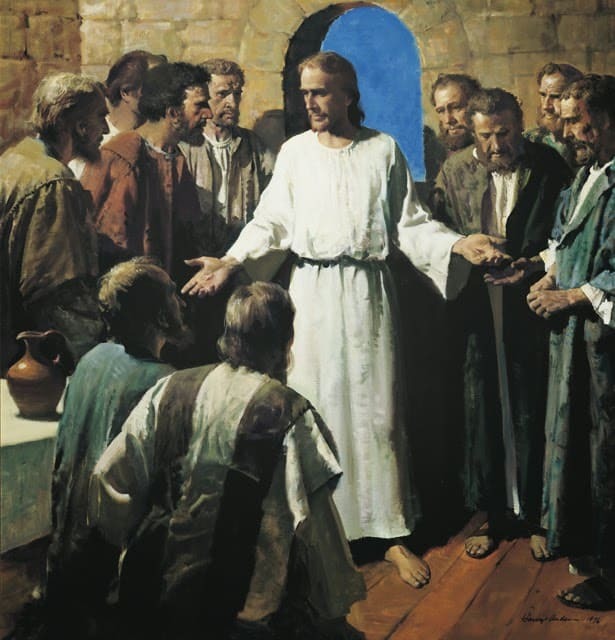 An important note: I am a member of The Church of Jesus Christ of Latter-day Saints (aka LDS or Mormon) so the scriptures I refer to use the KJV of the Bible, and day 24 uses scriptures from The Book of Mormon. 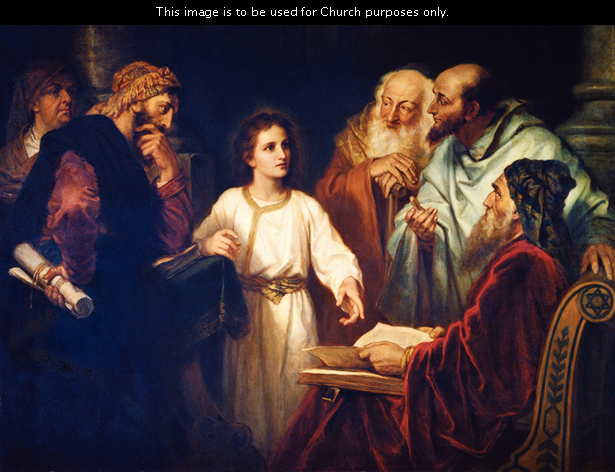 If you prefer to use just the Bible, you can download the Bible-only advent schedule here. 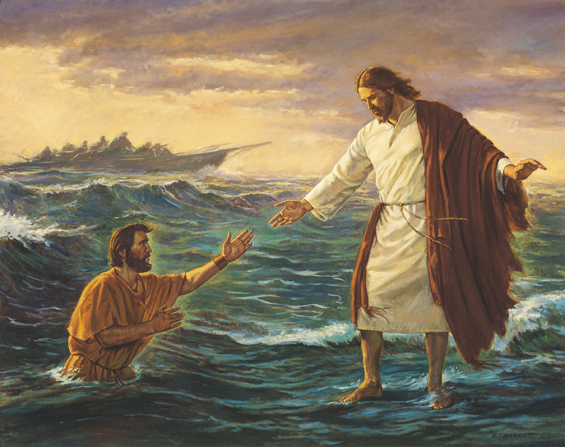 The scripture references and images below are linked to the scriptures and image library online at lds.org for your viewing convenience. *Specific supplies are listed for each craft; most crafts also require basic craft supplies like scissors, crayons/markers, and tape/glue. 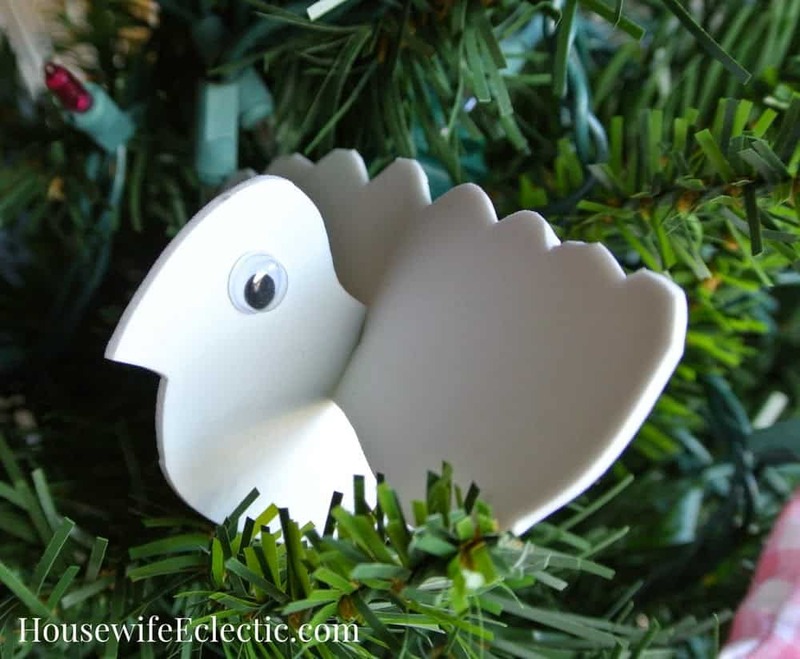 You will also need basic wire ornament hangers for most ornaments. Overlap the 5 popsicle sticks to form a star, and glue the overlapping tips. Add a loop of string or ornament hanger. 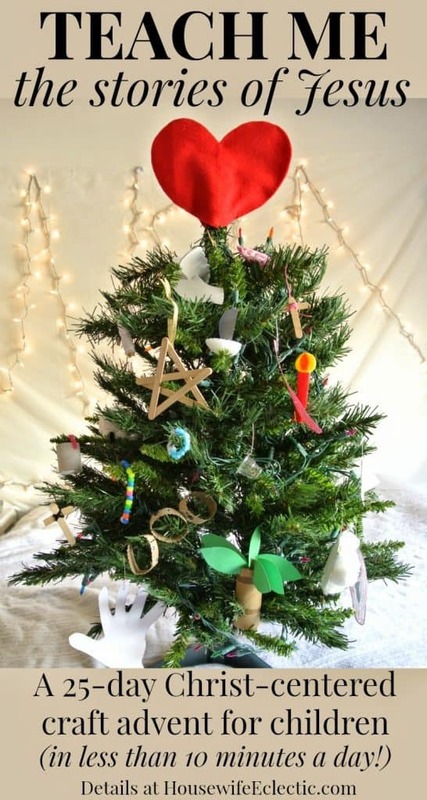 (Optional) Wrap the star with string, yarn, or twine; or decorate with markers or glitter. –For older kids, cut stars out of foil pans and let them poke designs like this. 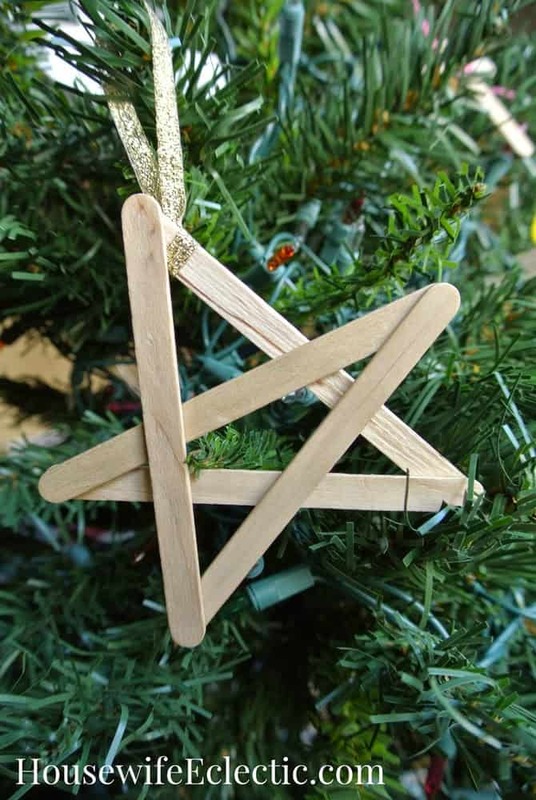 –Cut and glue simple 3D star ornaments from paper (like these). 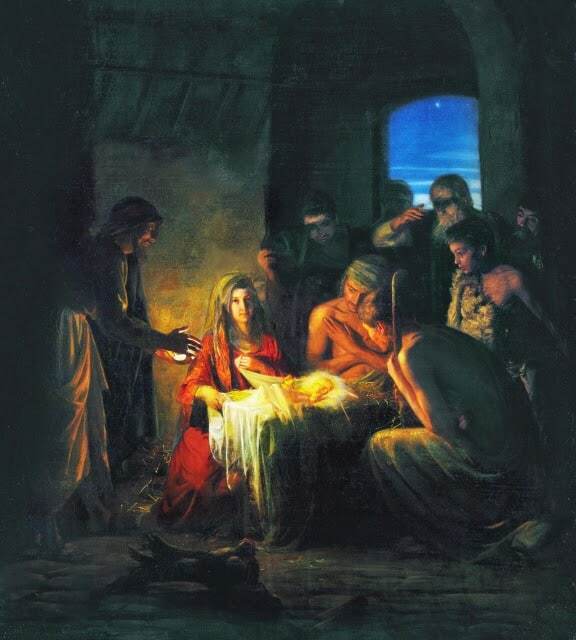 –Craft a baby Jesus in a manger, like this or this or this. 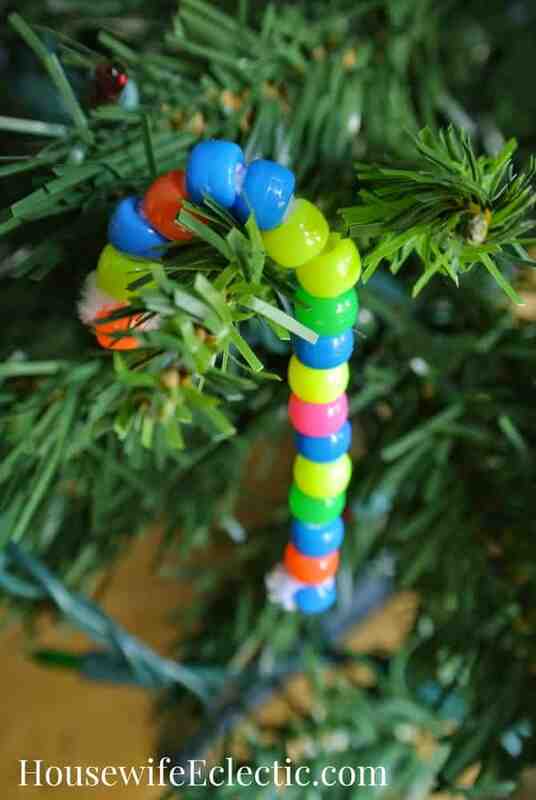 String the beads onto the pipe cleaner and form it in the shape of a shepherd’s crook to hang on the tree. Other craft ideas: –Use paracord to make the shepherd’s crook, following this tutorial. –Make an easy pasta angel. Last year: we cut 3 simple crowns from toilet paper tubes (using pinking shears) and stuck on adhesive jewels. This year we plan to: Make each clothespin doll a crown using paper scraps — pinking shears will make a quick and easy crown! 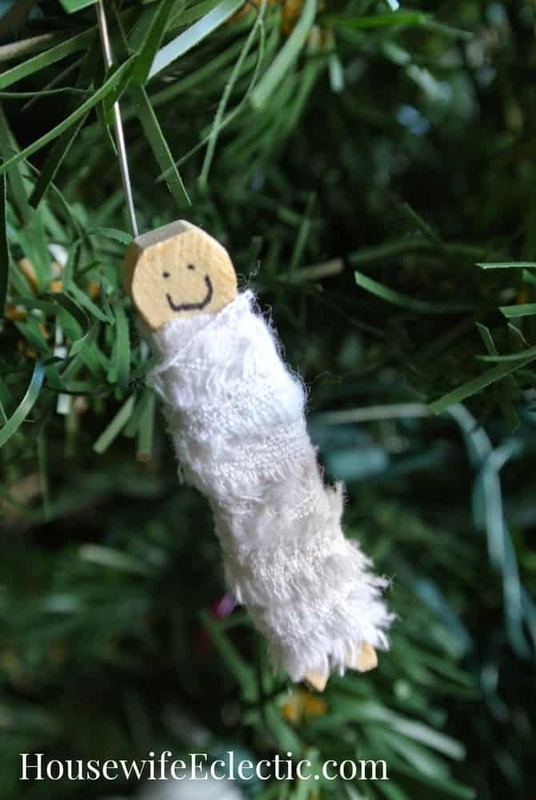 Wrap each clothespin doll in a scrap of fabric for a robe, and secure with glue or string. 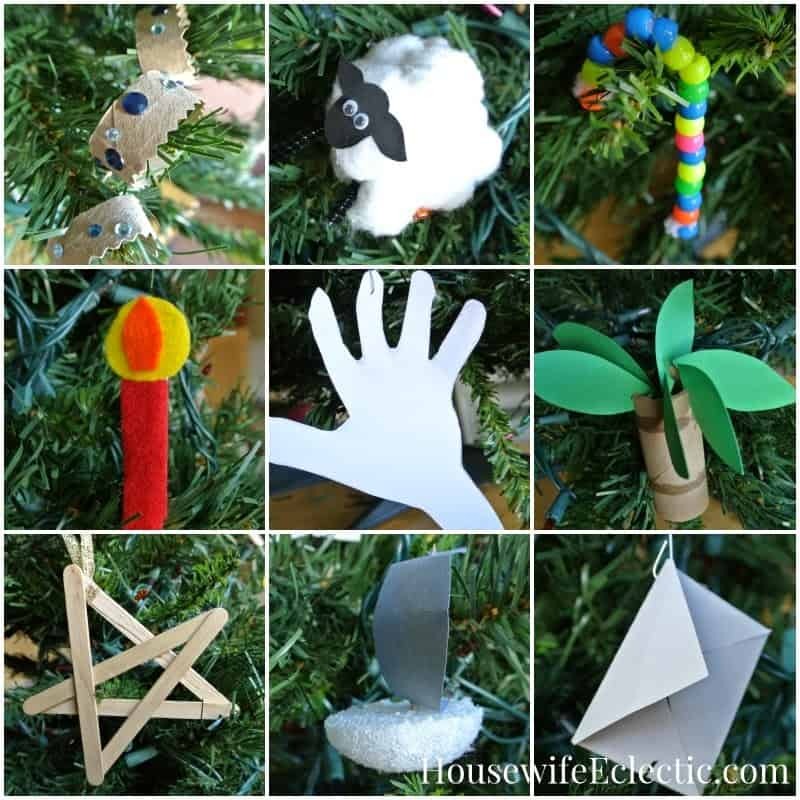 Attach an ornament hanger to each. 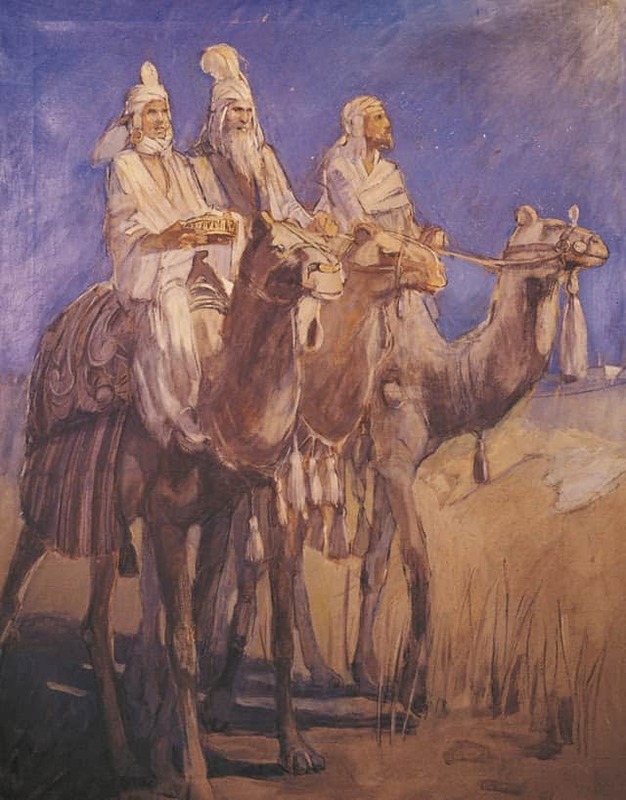 –Create a stained glass silhouette of the wise men using this technique. 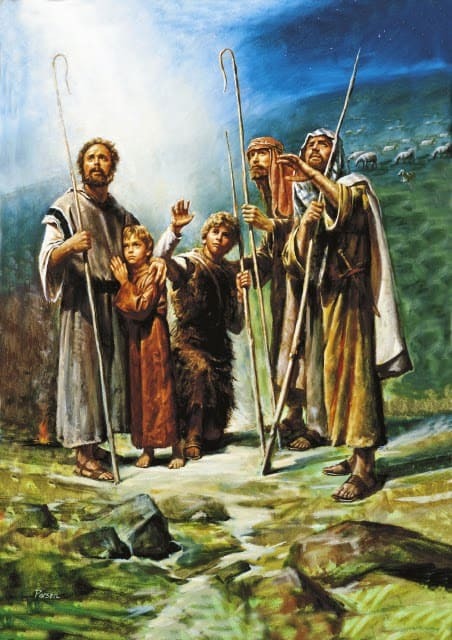 –Make the wise men from toilet paper tubes like this. –Older children will be able to make more intricate mini books, like these. Trace the template shapes onto the foam or cardstock. Cut out and assemble by sticking the wing notch into the notch on the bird’s body. Attach the eyes and an ornament hanger. –For older children who can handle a needle, use felt and fabric to make a plush bird/dove. Cut out the fish template and mark the head/face divider. Use the small circle stickers to cover the body of the fish to create scales. Add the googly eye and an ornament hanger. 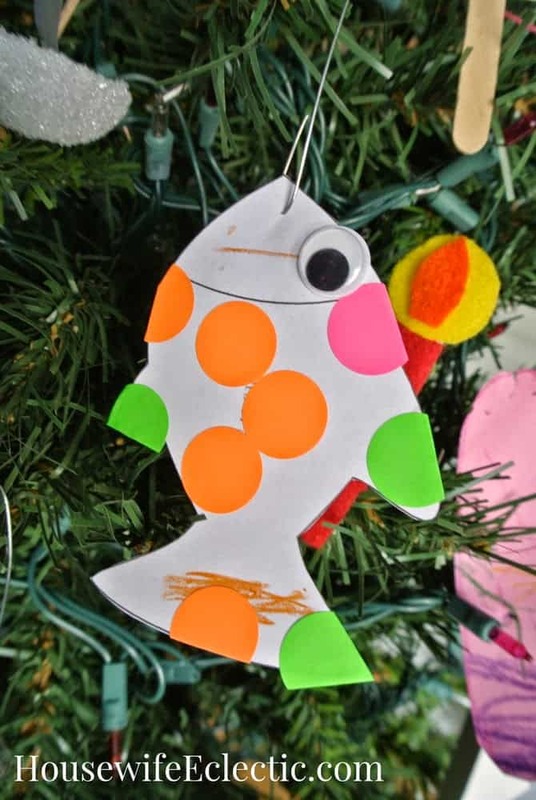 –Older kids who can use a needle can easily use felt and sequins to create a fish like this. Cut an orange teardrop shape and a yellow circle; glue the orange on top of the yellow. Cut a long thin rectangle (just larger than the clothespin) from the other color to be the candle. Glue the candle onto one flat side of the clothespin, and glue the flame on top. Clip onto the tree. 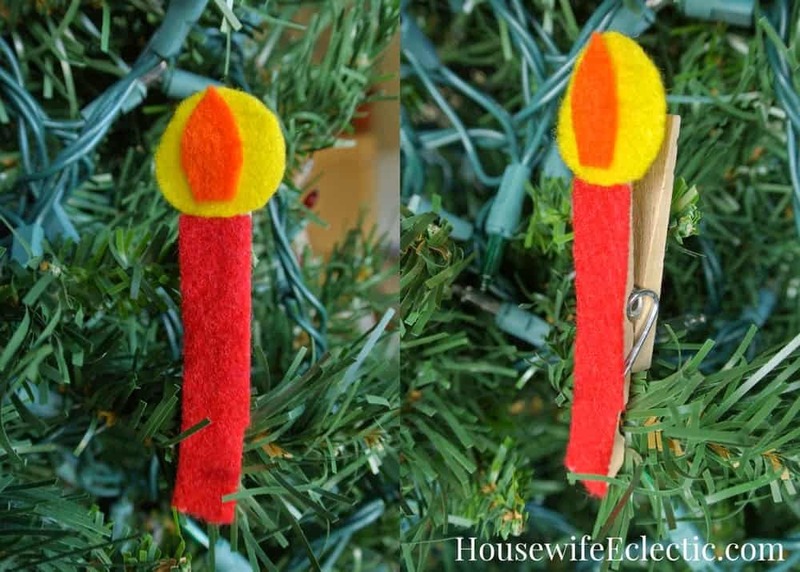 Other craft ideas:–Use old-fashioned peg-style clothes pins and pipe cleaners to make candles like these. –Older children can easily fold these 3D origami candles–Cut and fold mini LED tealight lanterns like these. 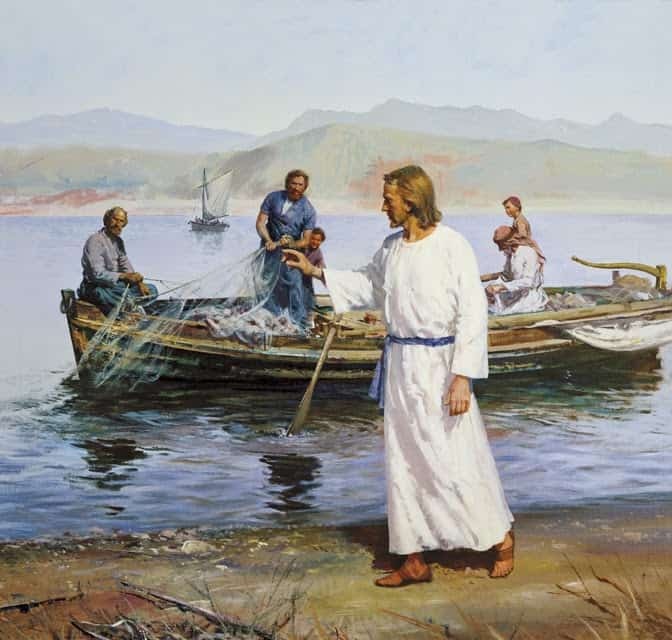 Last year: Assemble a boat by making a “sail” from the toothpick and a pointed oval shape, then sticking the toothpick in the cork or styrofoam ball. This year we plan to: Fold a paper boat following these instructions or these. 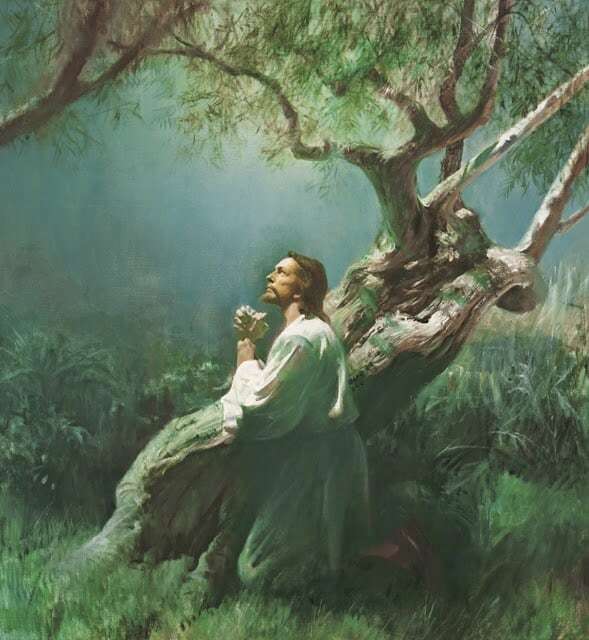 Nestle in the branches of the tree. –Make a kitchen sponge boat like this. 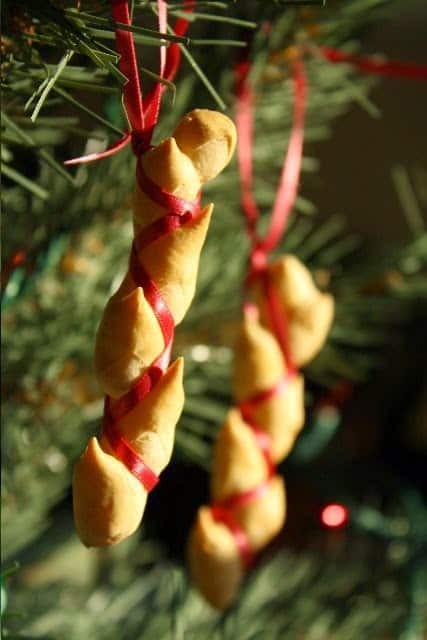 Last year: We made real bread ornaments following this tutorial tutorial. Really fun, but not a quick craft! This year we plan to: Following the templates, cut and glue the brown and white felt together as the bread, and cut out and decorate the felt fish. (Make as many as you like!) 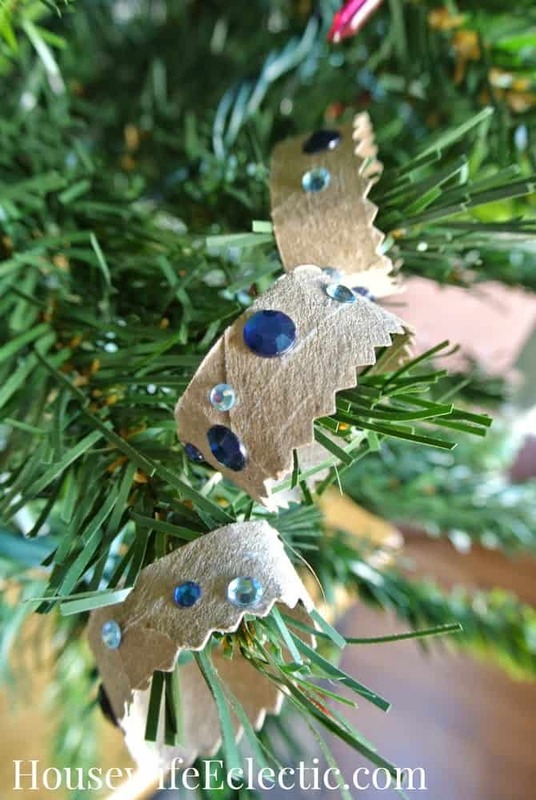 Insert ornament hangers into each. 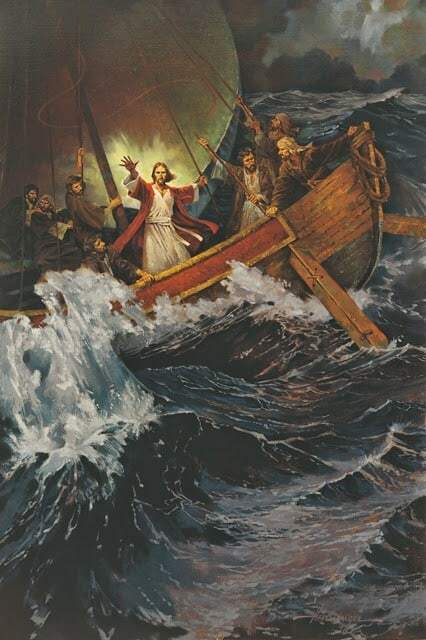 Other craft ideas:–Use this activity/coloring page to teach the story. Cut (or rip along the grain of the fabric) a long, thin strip of fabric for each doll. Wrap the fabric around the doll as a bandage. Insert/glue an ornament hanger. –Print and color this paper doll. Last year: we made a simple bead wreath with 9 beads in one color and 1 bead in another, to represent the 10 who were healed and the 1 who returned to give thanks. This year we plan to: Make a 10-leper paper doll chain. Print the template. Fold and cut according to the directions — cut on dotted lines, glue where indicated, then fold on solid lines and cut the outline. 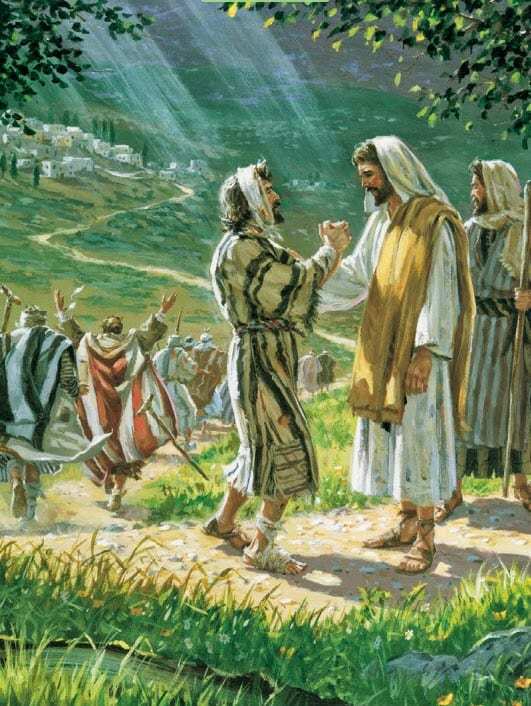 Be sure not to cut the folded edges at the man’s hands and feet. 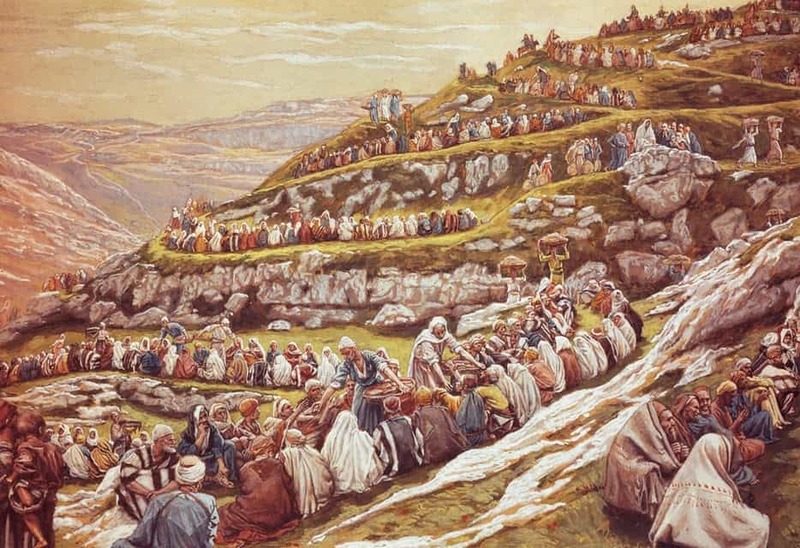 Count the “lepers” and color one to represent the one grateful leper. Other craft ideas:–Create a simple button wreath with 9 buttons in one color and 1 in another. –Cut a sheep body from black foam and wrap with white yarn, like this. 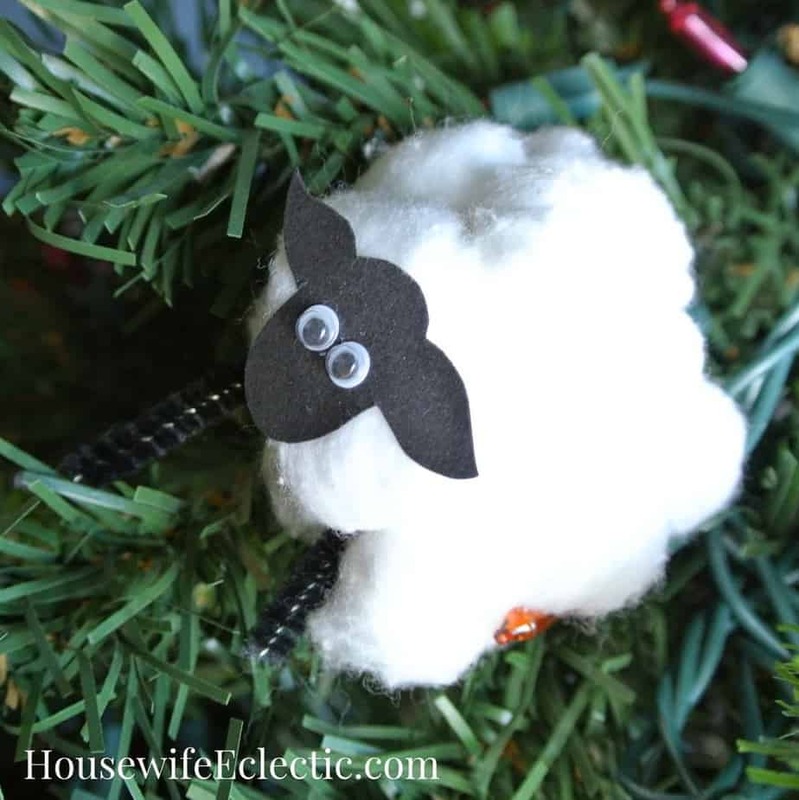 –Use wood rings and yarn to create sheep like this. 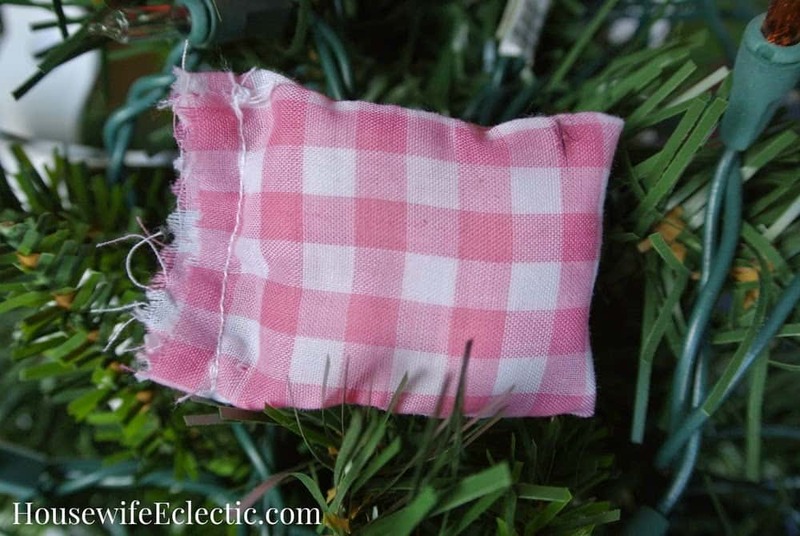 Last year: We made a tiny pillow from fabric scraps and stuffing, or from a piece of batting. This year we plan to: Make the pillow, and then cut a long thin strip of fleece, flannel, or similar to be the “bed”. Roll the fabric, stack the pillow on top, and secure with string to make a bedroll. 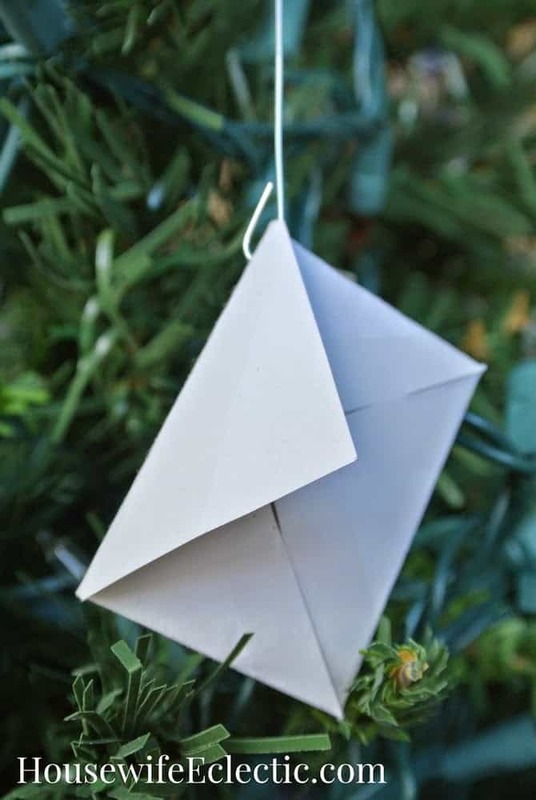 Attach an ornament hanger. 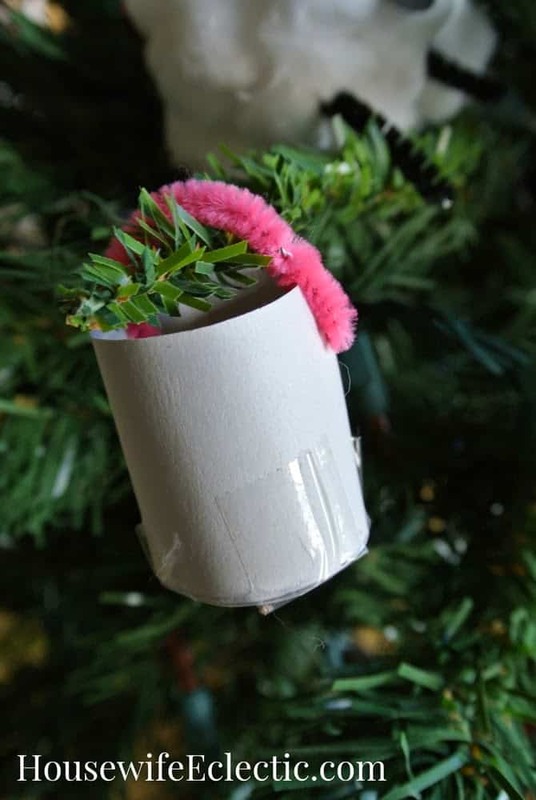 Last year: we made paper and pipe cleaner buckets. This year we plan to: Glue popsicle sticks (trimmed down depending on size) around the edge of the cup to create the well, leaving two tall on opposite sides. Glue a toothpick across the two taller sticks. 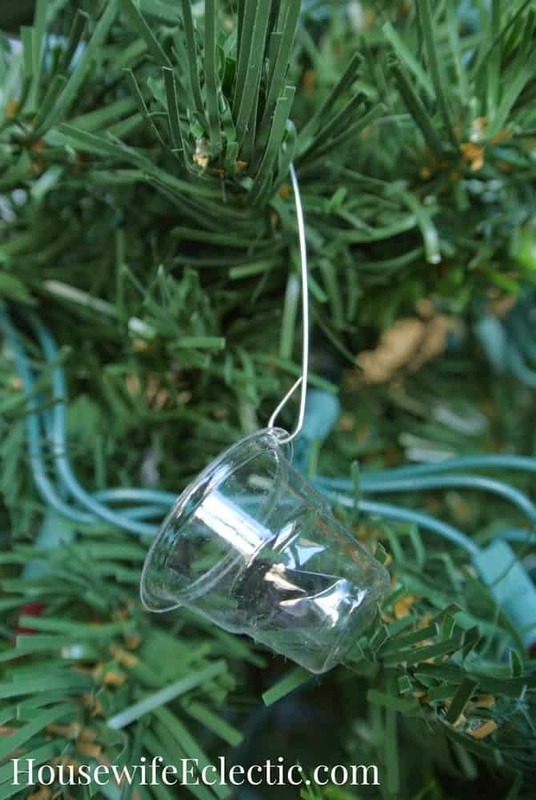 Attach the string to the smaller cup and then to the toothpick, so the “bucket” can hang down the “well” — like this. 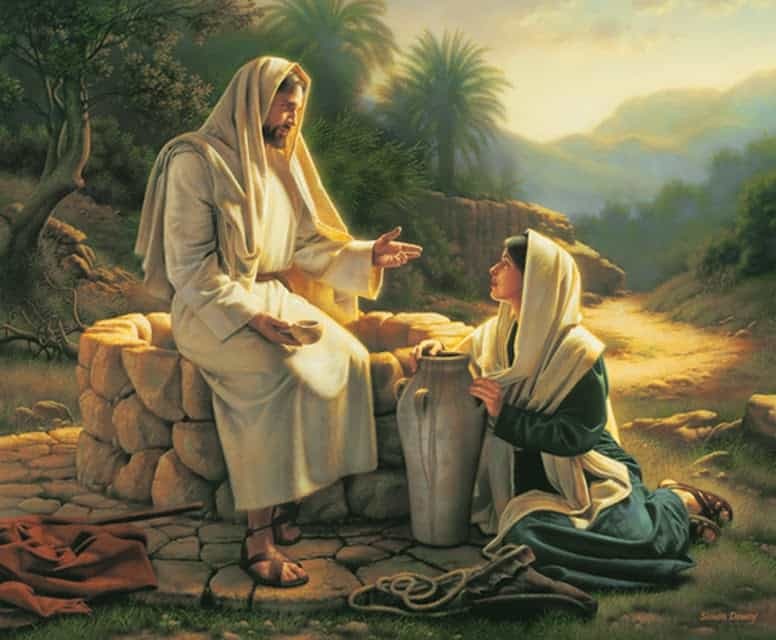 –Use small rocks to create a well like this. 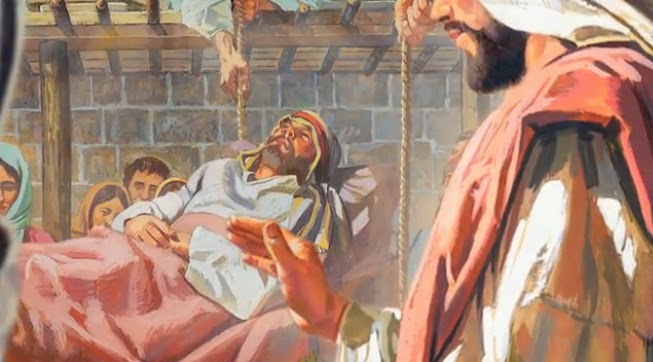 –Form a bucket and/or well from clay and bake/air-dry. Last year: we made mini envelopes out of cardstock and put pennies in them to symbolize our tithing. This year we plan to: Roll the salt dough out to 1/4-1/2 inch thick. Press the coins carefully in the dough to leave an imprint. Cut out the shape, and bake. 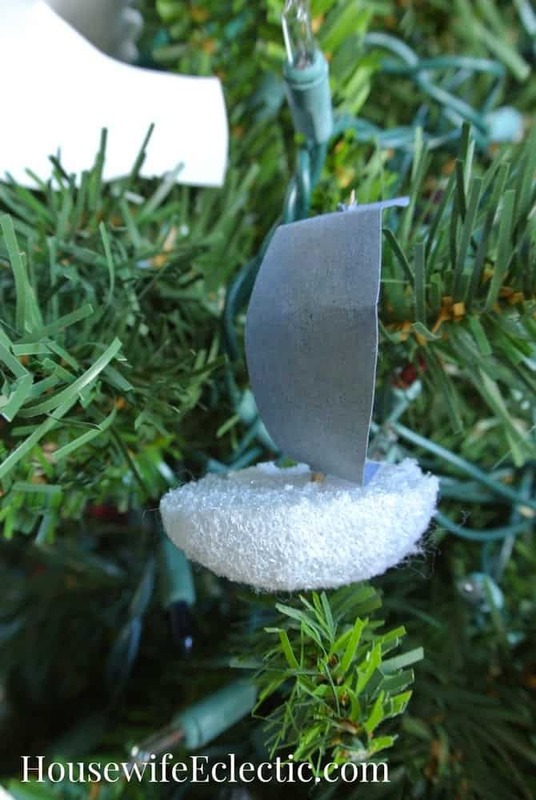 When dry and cool, glue an ornament hanger to the back. –Make a coin rubbing on paper. Color and cut out the ears. 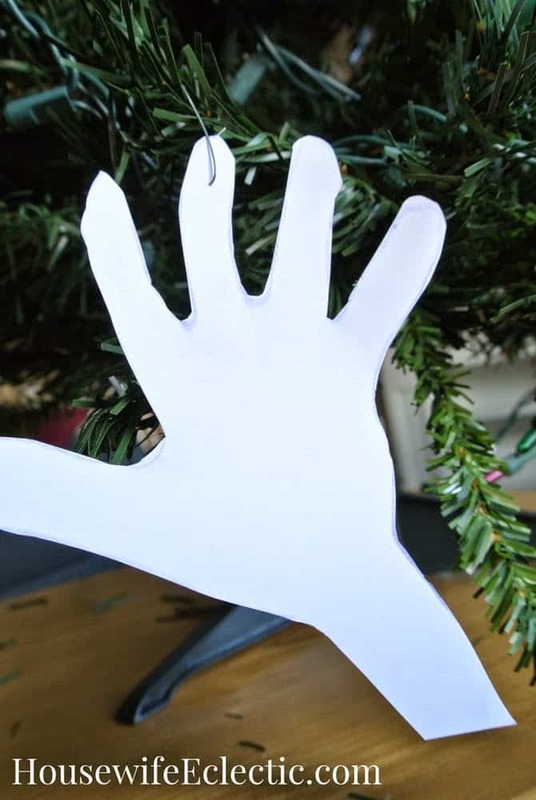 Connect one to each end of a 6″ (ish) piece of string and drape over a branch of the tree, or use an ornament hanger. Cut the cardboard tube to be 4-5″ tall. In the top, cut 6-8 vertical slits, about 1/2 inch long. Cut palm leaves (freehand or following the template). Place one palm leaf in each vertical slit; secure with tape or glue (optional). –Make a clothespin donkey like this. 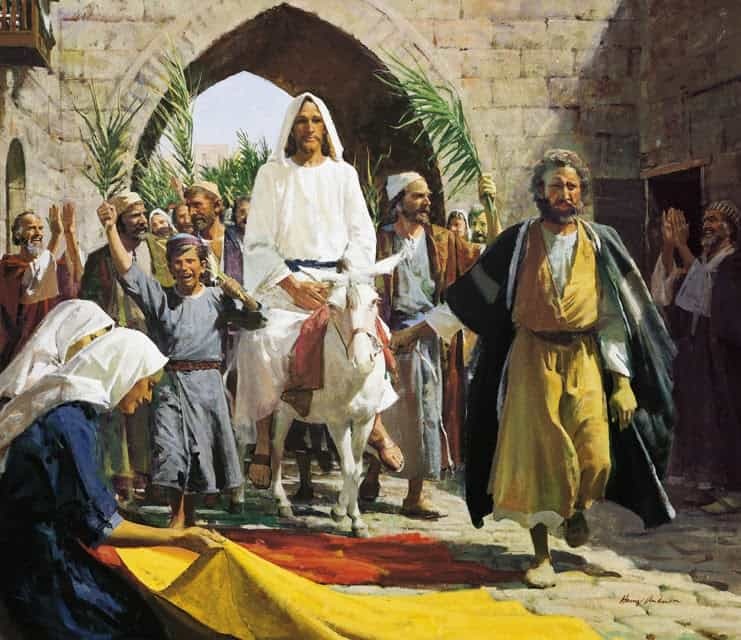 –Color this Jesus and donkey paper doll. 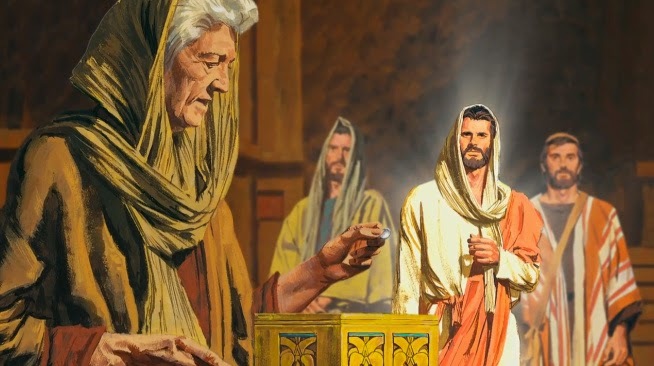 –Use this sacrament tray coloring page. Print and cut/score the paper box template . Decorate if desired. 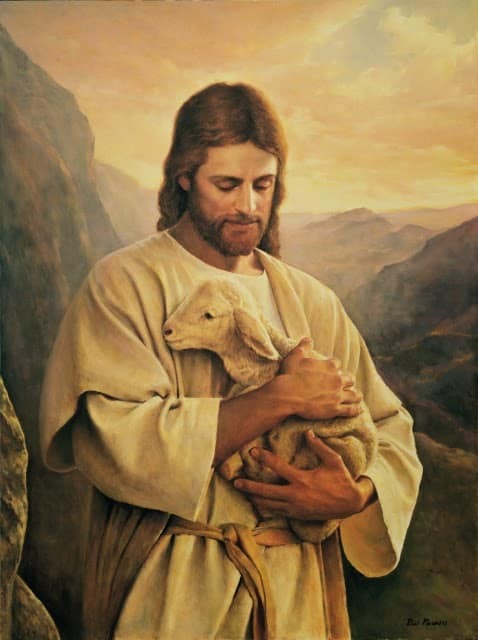 On the paper slip, write a gift you can give to the Savior this year (i.e., a sacrifice or change you can make to become more like Him.) 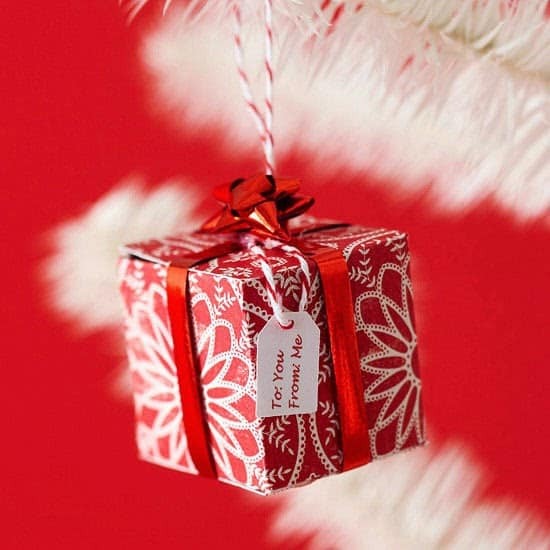 Fold the box, place the slip inside, and attach a bow and an ornament hanger. –Paint a wood block and wrap it with ribbon like this. Follow the template to cut the pieces of felt. 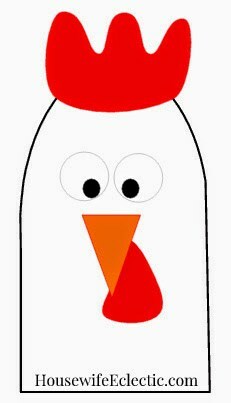 Glue the pieces together to create the rooster finger puppet. 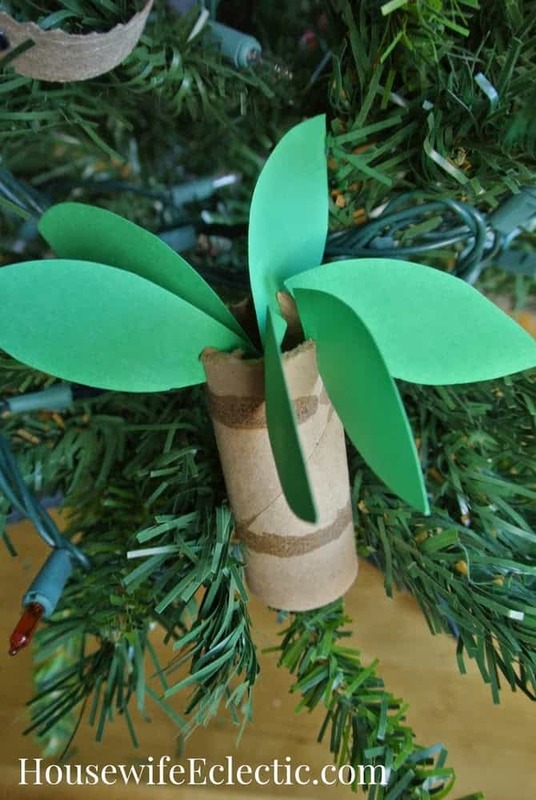 Place the puppet in the branches of the tree or on a clothespin clipped to a branch. –Use an egg carton, string, and felt to create a rooster like this. Glue the two sticks perpendicular to each other. 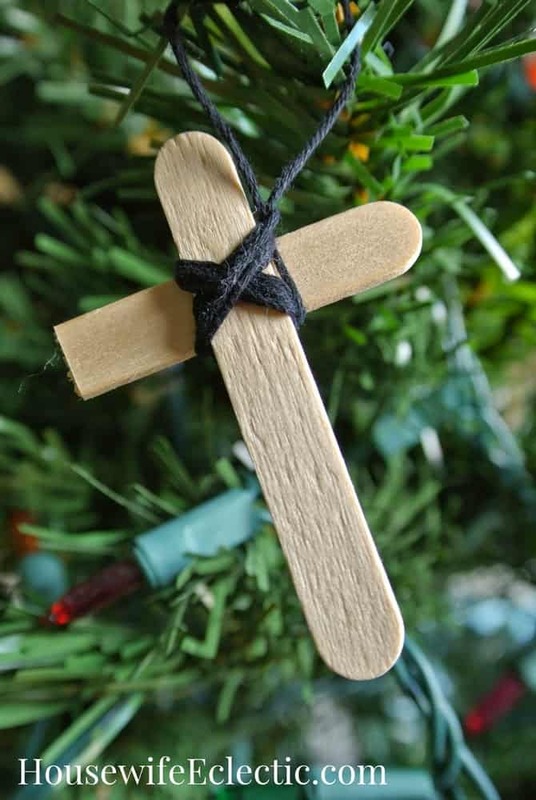 Wrap the center joint with twine or string, leaving a long loop to hang the cross on the tree. 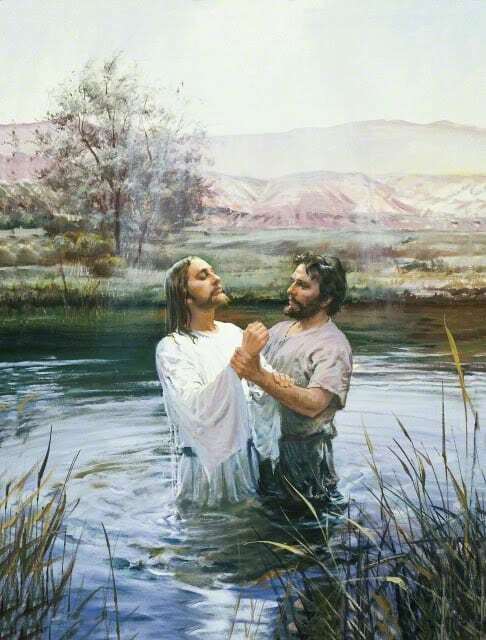 Last year: we traced and colored our hands to remind us of the marks in Jesus’ hands, and that we can act as His hands now as we do good and serve others. 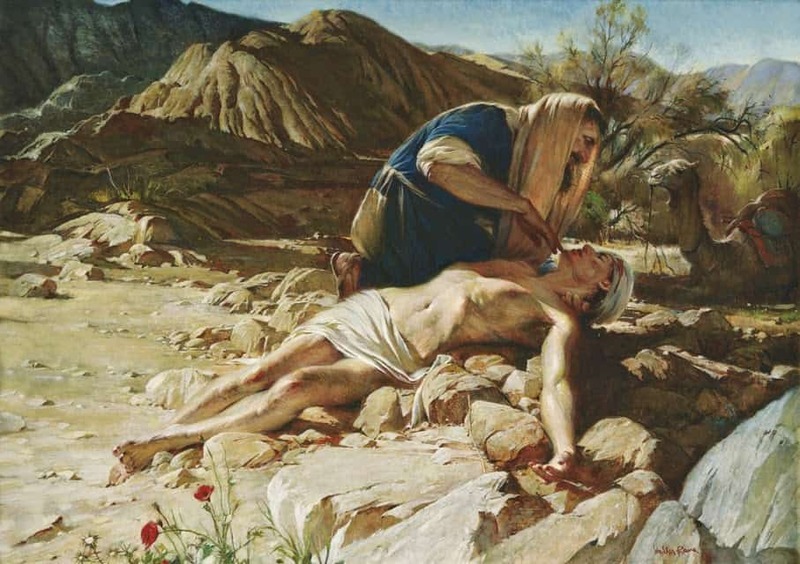 This year we plan to: Use salt dough to create an empty tomb. Attach a hanger (carefully!) and then bake. 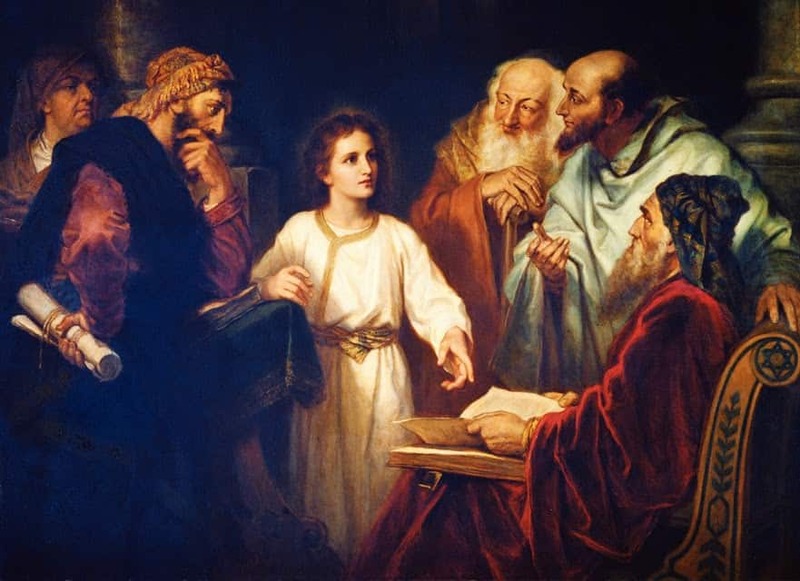 **Note, if you are doing the Bible-only advent, adjust this to do the heart craft with the Luke/Road to Emmaus scripture on the 24th and then the cloud craft with Acts/Ascension on the 25th — like the printed Bible-only schedule here. 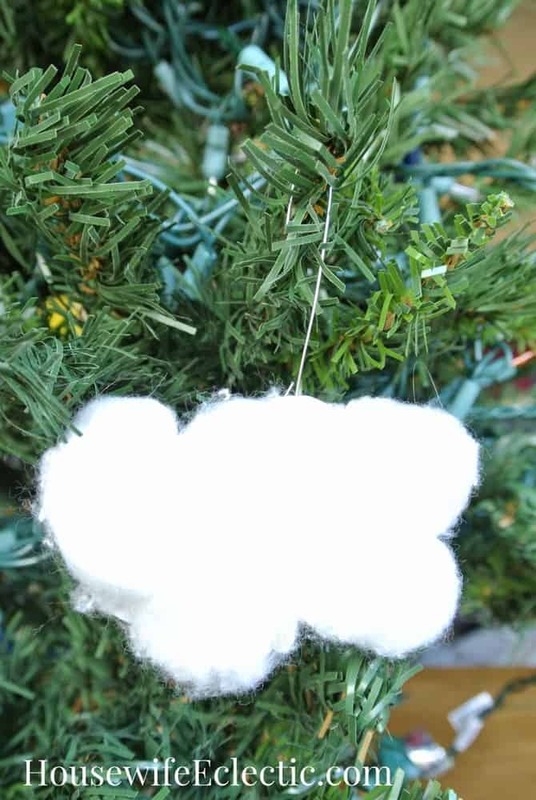 Cut the cloud template from white cardstock and glue on cotton balls or pom-poms. (Optional) Use the pipe cleaner to create a lightning bolt and attach to the cloud. Add an ornament hanger. 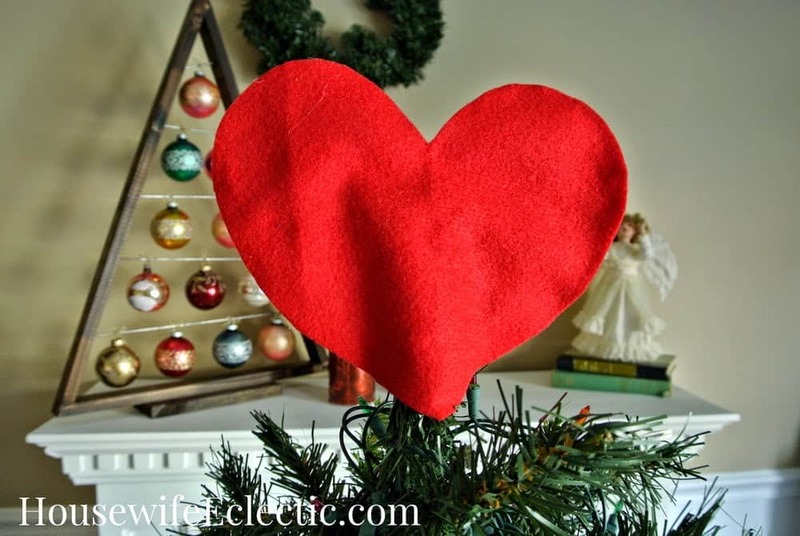 Cut two large hearts from red felt. (Mine are approx 8″ tall by 9″ wide.) Attach them to each other around the edges *except* at the bottom tip and about 4 inches up, to create a pocket for the top of the tree. Flatten the top half of the toilet paper tube and slide it into the opening at the bottom of the heart. 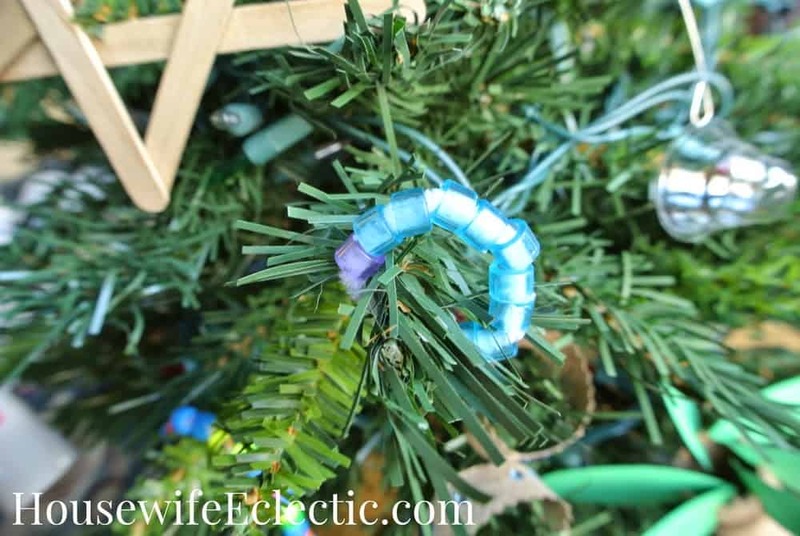 Secure it with hot glue to form the tube to keep the heart on the top of the tree. 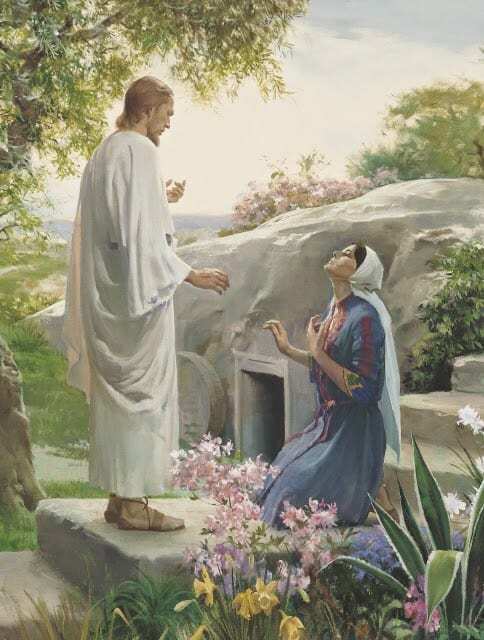 This year we also plan to add a simple frame and picture of Christ for each child: Cut a rectangle frame from the foam (or buy a premade craft foam frame). 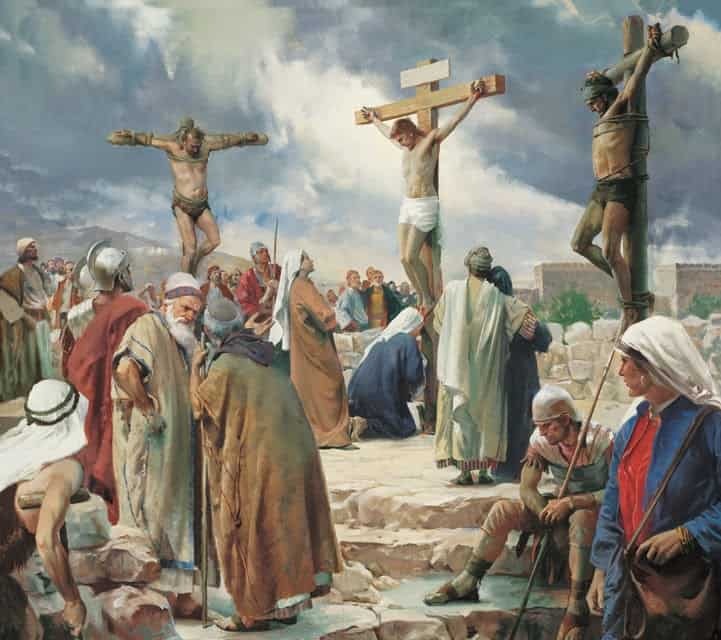 Decorate the frame and then tape the picture of Christ in the picture to keep all year-round. Lu (or Lorene if you prefer) is the mom of 3 kids and wife of a singing and dancing elementary teacher. She happily shows up here at Housewife Eclectic a few times a month, when the creative bug strikes in between projects at her awesome job as a virtual assistant. 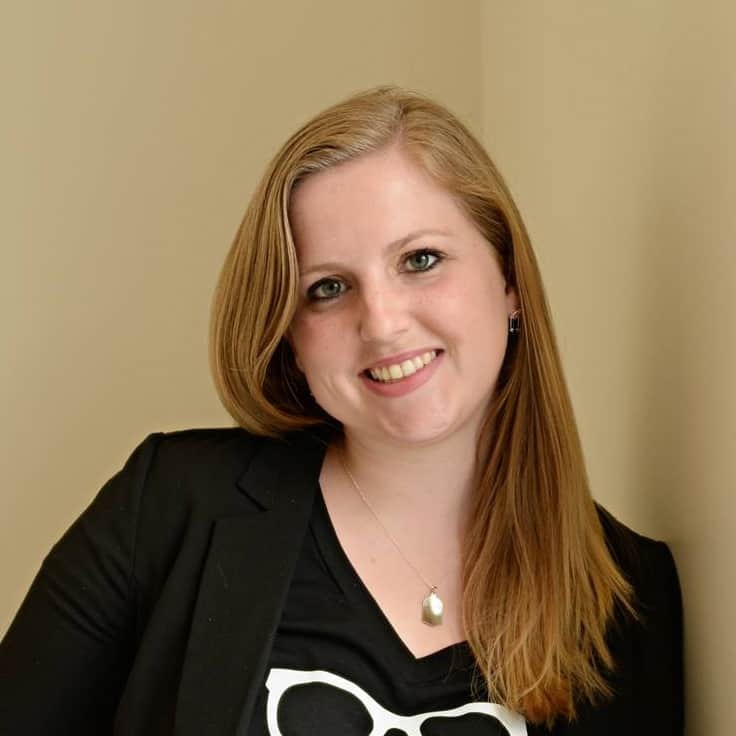 You can check out her other projects here on Housewife Eclectic, or her former blogger life over at just Lu. That is a really great idea. I love all the crafts involved. Thanks, Michelle! I hope your family loves it! 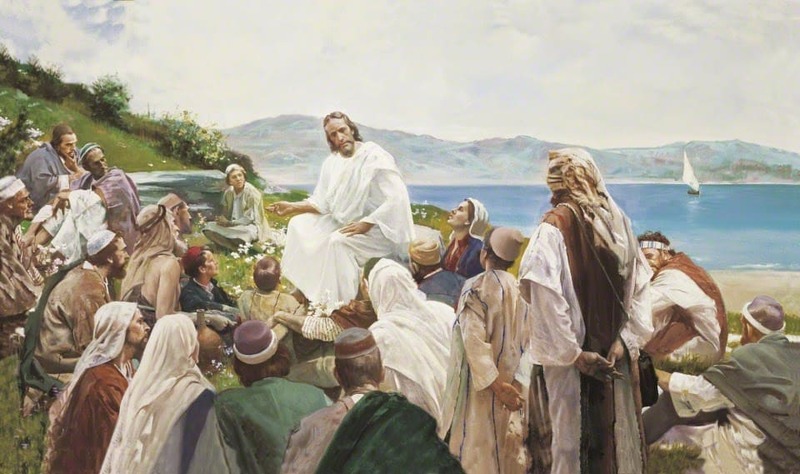 I love the idea of crafting and tying it into Scripture reading. Pinning the post to find it later in case I get a burst of energy to do it with my younger boys. What a great idea! This is a great way to celebrate the season for any religious family. I love it! These are great ideas! Too often its Santa centered even in Christian homes. These are great ideas to get the kids involved this year. They would enjoy making the crafts. What a really nice idea. I am going to show this to my son's preschool teacher, which is at a church. They might want to do this. 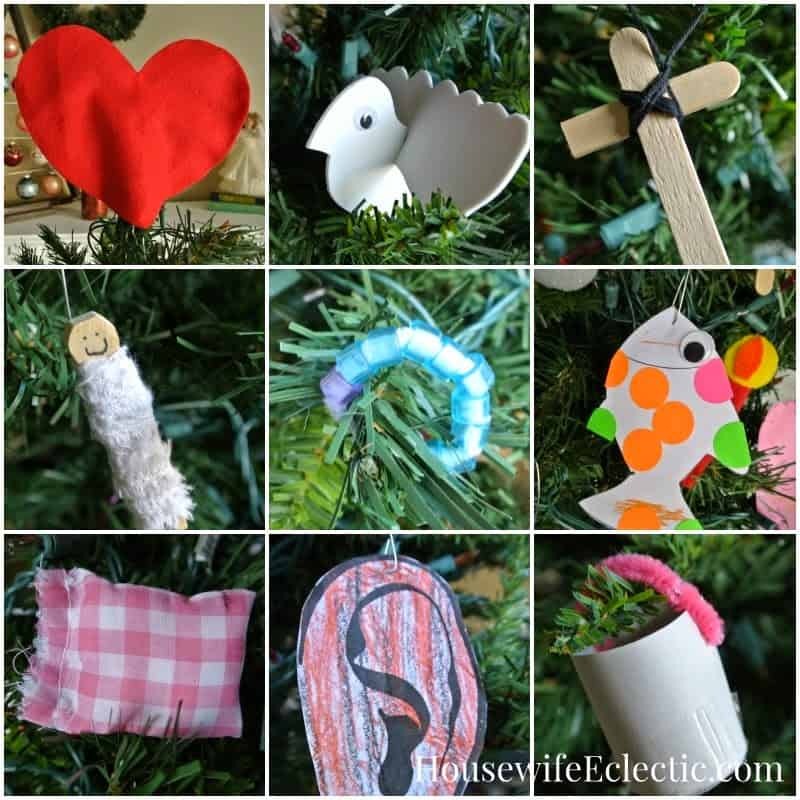 Great craft ideas that could definitely be made part of every kid's annual holiday traditions. I love it! I think we might need to try this idea out this year. This is such a great idea! I will have to do this with my daughter this year! This is so much fun. My boy and I love to do crafts and he loves talking about Jesus and God. Thank you so much for putting all this together! This is so great! 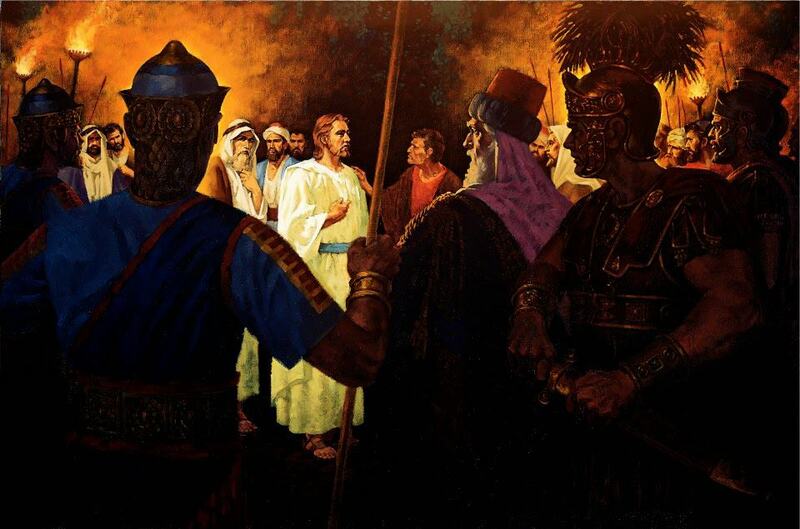 We were just talking about the origins of Christmas today! You really covered it so thoroughly with all of these ideas. What a terrific resource! This is so great! The boys and I are having fun every night doing our craft together and reading scripture! 1) I'm first year seminary teacher and we are doing the New Testament this year and WOW this tree just brings CHRISTmas to life! so i will have to take it in after to show them (since we are on break now)they're going to LOVE IT!! 2) well this year my hubby and kids are on our own for Xmas eve, since my Mom passed away 2 years ago my siblings and I are little disoriented so we won't be getting together until later Xmas day ( we usually do Xmas Eve) but anyway I was looking for a tradition to do with my kids since I want it be JUST that the main purpose of Christmas is telling Christ's story and mission and Birth! my family is of many faiths so not much religion talk goes on when we get together but us being LDS It's a MuST!!! Is there a “master list” of supplies needed? I can’t find one. Having a shopping list would make this so so so perfect!